I’m always on the lookout for great apps…and great apps that allow four kiddos to play and learn at the same time…KILLER! I’ve been a huge fan of Operation Math. 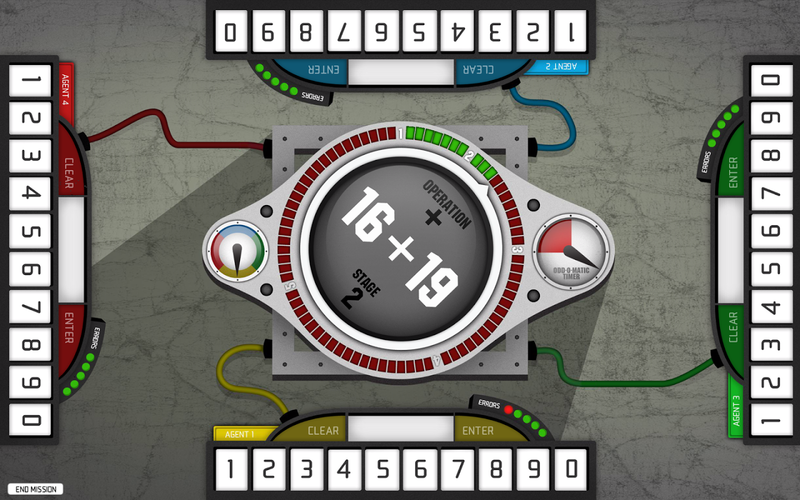 With a secret agent code-cracking format, Operation Math is an awesome and engaging place to practice math facts for students at the elementary level. Just when it couldn’t get any better, the same folks at Spinlight come out with a new app, Code Squad! The format is a bit different. We’re still practicing our facts, but with four agents seated around a single iPad, more kids are touched and the practice becomes a bit more competitive…in an interesting way! Each agent is allowed up to 5 errors in computation. A fact is flashed in the center and each agent gets the opportunity to answer it. All four agents are really working together to keep facts flying and crack the code, but agents are “cut off” of play when they reach those 5 errors. If at least one agent can keep rolling with the facts, play continues and a round can still be won. With 20 secret agents and only 5 iPads in my classroom, you’d be amazed at the level of engagement and excitement in my classroom! Differentiation, engagement, and hands-on play for everyone…even with a minimal amount of iPads! If you are a teacher with 1-to-1 mentality but a 1-to-5 reality, Code Squad is the game for you! I’m so hoping more developers/designers jump on board with a similar format! Check out Spinlight here. This app is also available for purchase on Nook and Android devices, so it opens up a whole great world of high-quality learning beyond the iPad! Spinlight’s site has great info and is also a place to purchase these apps. You can also purchase the apps at the App Store! It’s the best $2.99 I’ve ever forked over for an app. Give it a try…and share your feedback! I’d love to hear what you think! Show Me You Know Math!